The Singapore dollar is the official currency of the island state of Singapore. It is divided into 100 cents and is coded as SGD. The Singapore dollar is commonly abbreviated with the dollar sign $, or S$ to distinguish it from other dollar-denominated currencies. In Singapore, the dollar is also known as “Sing”. All Singapore dollars and coins are issued by the Monetary Authority of Singapore. The first set of Singapore coins were introduced in denominations 1, 5, 10, 20, and 50 cents and 1 dollar. Singapore used the Straits dollar from 1845 to 1939. It was ten replaced by the Malayan dollar, which in turn was replaced by the Malaya and British Borneo dollar in 1953. Singapore used this common currency until the Malaysia, Singapore and Brunei monetary union broke down in 1965. Singapore became independent in 1963, and issued and issued its first coins and notes on April 7, 1967. Singapore pegged its dollar to British Pound Sterling until the early 1970s, then to the US Dollar for a short period of time. Singapore pegged its currency against a fixed and undisclosed trade-weighted basket of currencies from 1973 to 1985, reflecting its diversified trade links. 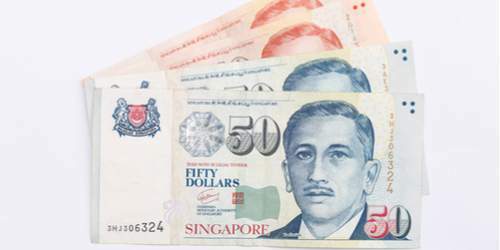 From 1985 onwards, the Singapore Dollar has floated within an undisclosed bandwidth, closely monitored by the Monetary Authority of Singapore (MAS) to guard against imported inflation and ensure that Singapore's exports remain competitive. As of 2012, the total currency in circulation was S$29.1 billion. All issued Singapore currency in circulation (notes and coins) are fully backed by external assets in its Currency Fund to maintain public confidence. The Singapore government announced that the Currency Fund will be merged with other funds of the MAS in the second reading of the Monetary Authority of Singapore (Amendment) Bill 2017 because the currency in circulation is effectively backed by the full financial strength and assets of MAS, which is much larger than the Currency Fund. After the financial crisis, the SGD became one of the top-performing currencies. The Singapore dollar is the twelfth most traded currency in the world, and the third most in Asia, next to Japanese yen and the Renminbi. With its continuous growth, the Singapore dollar is definitely worth investing into. If you are into Forex trading, you should consider trading with Financials Trading Online (FTO) today. They offer a wide variety of currency pairs and the best forex trading service in the market.